Chris Field is the Western Australian Ombudsman. He concurrently holds the role of Energy and Water Ombudsman. Chris is also the Chairman of the State Records Commission. Chris is the Second Vice President of the International Ombudsman Institute. The Institute represents 170 Ombudsman institutions from more than 90 countries. Prior to his election as 2nd Vice President, he served as the President of the Australasia and Pacific Ombudsman Region of the IOI, between 2012 and 2014, before being elected as the Treasurer of the IOI, a position he held between 2014 and 2016. Chris is also a member of the Australian and New Zealand Ombudsman Association (ANZOA), the peak body for Ombudsmen in Australia and New Zealand. Chris is an Adjunct Professor in the Faculty of Law at the University of Western Australia and founder and co-coordinator of the unit, Government Accountability – Law and Practice. Chris is also the author of a range of publications on law, economics and public policy, including the university text, Current Issues in Consumer Law and Policy. 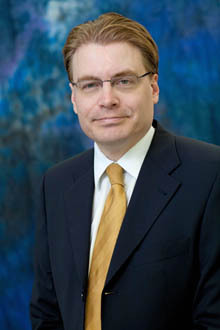 He is also the 'Consumer Dealings' editor of the Australian Business Law Review. He commenced his career as a lawyer at Arthur Robinson and Hedderwicks (now Allens Linklaters), prior to holding the roles of Executive Director, Consumer Law Centre Victoria and Chairman, Australian Consumers’ Association (now Choice). Immediately prior to his appointment as Ombudsman, he was an inaugural Member of the Economic Regulation Authority. He holds Arts and Law (Honours) degrees.